That's a whole lot of tapping. Judging by the high number of emails we receive, more people love Flappy Bird than hate it. For every negative article, there are several gamers eager to show off their high scores to the world. Case in point, Brady Mank and his outstanding 412 points. Thus far, this is the highest non-hacked score we've seen. We can't even imagine the intense pressure Brady felt as he crossed 200, 300 and 400 points. Maybe he read these Flappy Bird tips. For now, the game is in limbo, as it was removed from iOS and Android app stores. 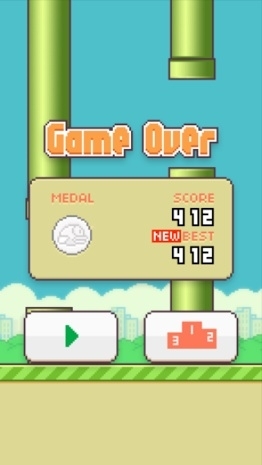 Thankfully, enough people downloaded Flappy Bird that it'll remain popular for quite some time.